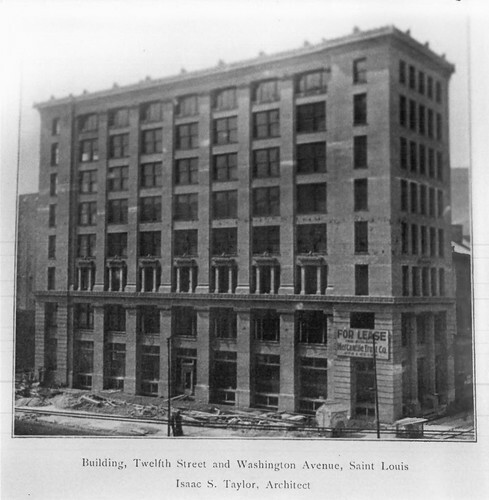 Designed by architect Isaac Taylor, the buff brick and terra cotta Silk Exchange Building was completed in 1902 at the southwest corner of Tucker and Washington. 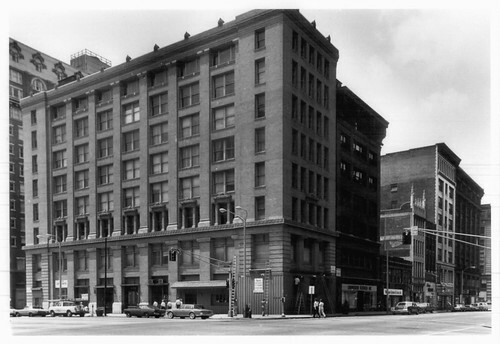 The building's name came from the Silk Exchange Realty Company, which leased the building in 1907. The owner of the company was a merchant of velvet and other silk fabrics, though he occupied only a portion of the ground floor. The remaining floors were sub-let to various small manufacturers of clothing, millenry, fabric, buttons, lace, embroidery, etc. 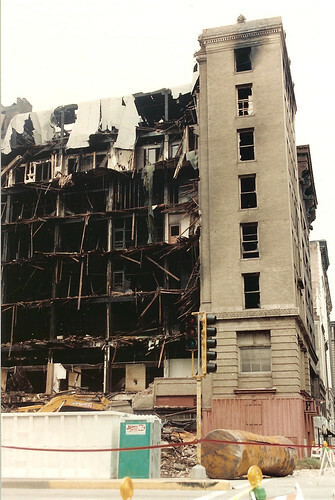 In September 1995 the Silk Exchange had a disastrous fire and much of the main load bearing masonry facade along Tucker Boulevard collapsed into the street as did about a third of the width of the narrow building. 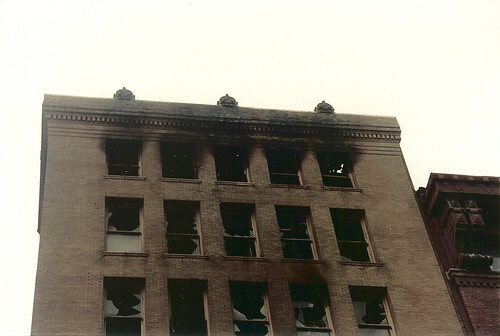 Unlike many that have either burned or had their interior structure collapse from extensive neglect and deterioration, the damage to the Silk Exchange was so extensive that even if the Missouri Historic Tax Credit had been in place in 1995, it is questionable as to whether it would have been eligible due to the high percentage of loss of the exterior of the building. The remains of the building were ordered to be demolished immediately and was cleared in an astonishing five days. Spirtas Wrecking Company's website lists the Silk Exchange as one of their "Milestones". 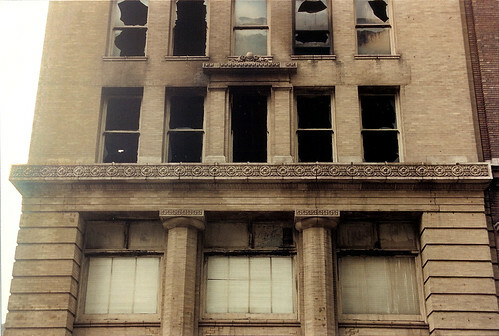 Although scorched, the Washington Avenue facade remained fully intact. 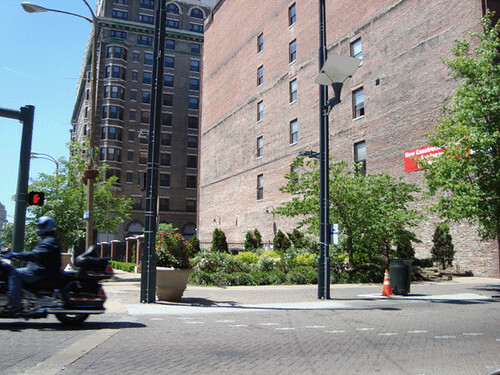 Several years after the fire, when the adjacent building at 1204 Washington was redeveloped for offices and residential lofts, the lot was paved for parking with a small pocket park at the corner of Tucker and Washington. The parcel remains in ownership by the City's Land Clearance for Redevelopment Authority, with the parking leased to the adjacent building. Prior to the collapse of the real estate market, there were a few proposals for new construction on the site. 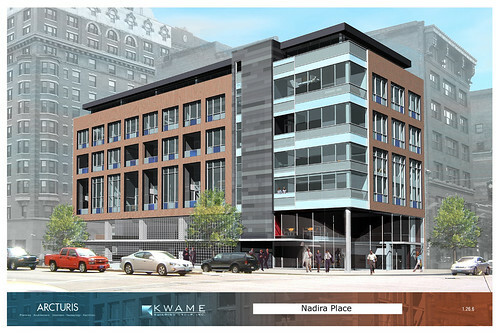 The Nadira Place proposal above would have been mostly residential. The proposal would have had garage parking at the ground and second floors exposed for the majority of the facade along Tucker, which would have been very unfortunate. A slightly smaller but more interesting design by Trivers would have offices with retail/commercial space taking the entire ground floor. 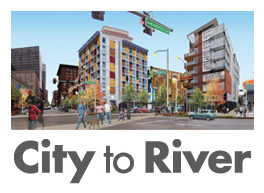 With the site's key location at the intersection of two major streets at the heart of the Loft District, there is no doubt that there will be further proposals for new construction when the economy finally rebounds. 1612 Knapp, middle of the three homes grouped in the center. Carr School has been removed from the final Preservation Board agenda for Monday. 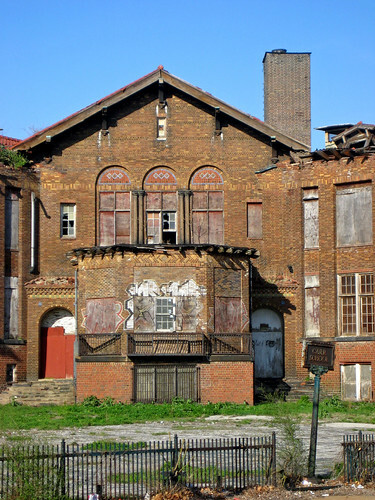 Both Carr School and 1612 Knapp, owned by Paul McKee's Dodier Investors LLC had been brought to the Preservation Board by the City's Department of Public Safety, which sought condemnation for demolition of the buildings. 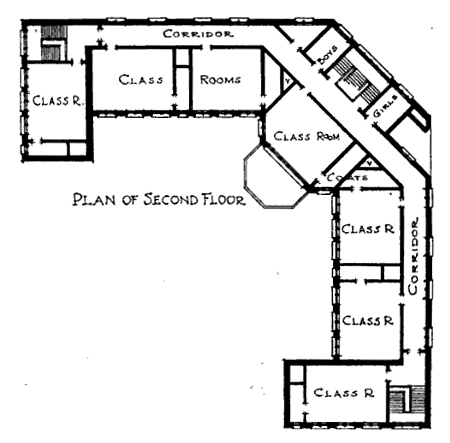 1612 Knapp, which is located in the Clemens House-Columbia Brewery National Register Historic District has been removed from the final agenda as well. 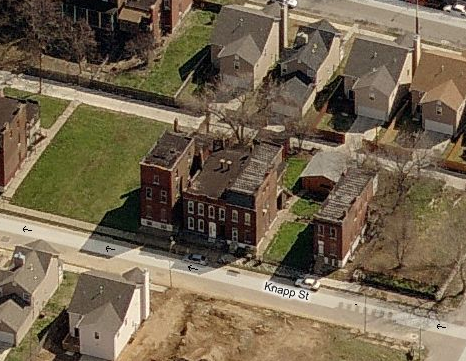 The proposed demolitions of 3959 N. 11th in Hyde Park as well as 1925 S. 10th in Soulard, sought by Rothschild's Rehab Girls LLC (or is it Demolition Girls?) are still listed on the agenda. As reported recently by Dotage, Carr School will be up for condemnation review at this months Preservation Board meeting on Monday, October 26th. The City's Department of Public Safety is seeking a condemnation for demolition. While this would not necessarily mean an immediate demolition, it would place the building on the City's list for rotating demolition funding. The school is owned by the Carr Square Tenant Management Corporation, who according to the City's 5-year Consolidated Plan for Carr Square, would like to see the building renovated into senior housing and small scale commercial use. 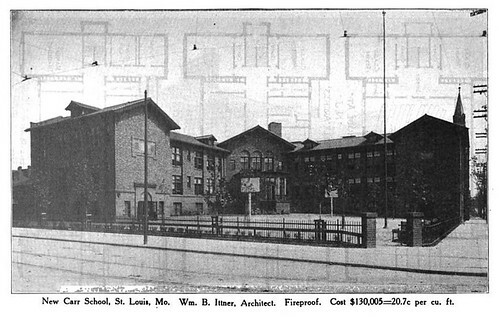 Carr School as seen in the 1915 publication: American School Building Standards. The steeple of St. Pater's German Evangelical Church (demolished) is visible behind the south end. 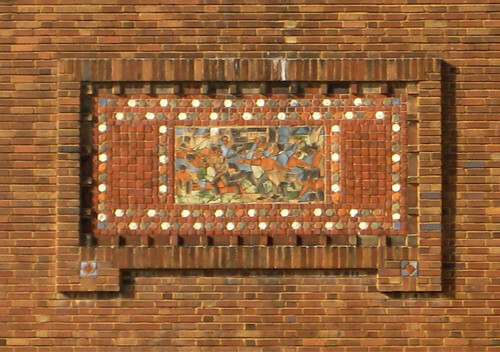 Carr School, designed by William B. Ittner, was built in 1909 and opened in December of that year. It was closed in June 1978 and has been abandoned for well over 25 years. The building was listed on the National Register in December 2000 following a nomination prepared by Landmarks Association, which makes it eligible for Federal and Missouri State Historic Rehabilitation Tax Credits. The projecting bay at the center of the school contained the kindergarten. The openings at the end of the bay, which have been altered, originally had pairs of tall french doors with transoms above opening to the small balcony areas. adorn the ends of the two wings that face into the school yard. In recent years, the roof of the building has suffered heavy deterioration resulting in a large collapsed section at the center of the school as well as a small section at the south wing. 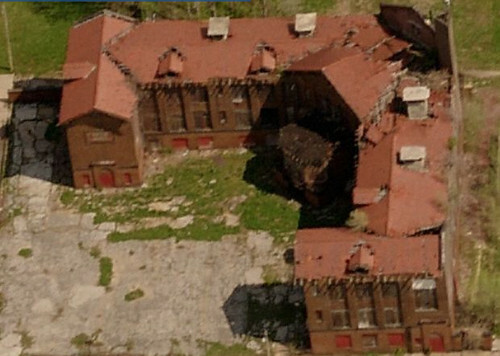 The school however is far from being too far gone to rehabilitate. With the exception of the roof, the structure of the building was built of "fireproof" concrete. Interior photos from a fellow Flickrite's photo set shows that while the building is a mess as would be expected, the structure beyond the roof is quite sound and a good candidate for renovation. 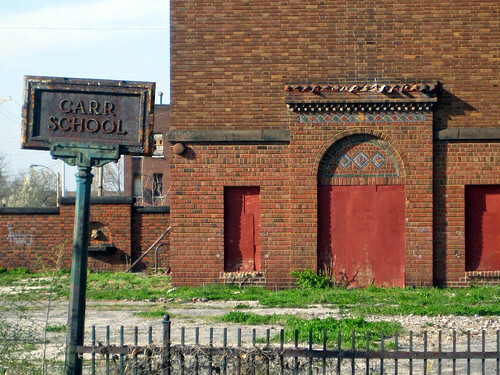 A previous post of here on Vanishing STL gives two examples buildings that had far worse collapse and decay than Carr School. Both the Lister Building and International Shoe Buildings, which were literally shells for a good percentage of the total building in both cases were successfully rehabilitated into loft apartments (unfortunately the Switzer, which was the main subject of that post was eventually demolished). 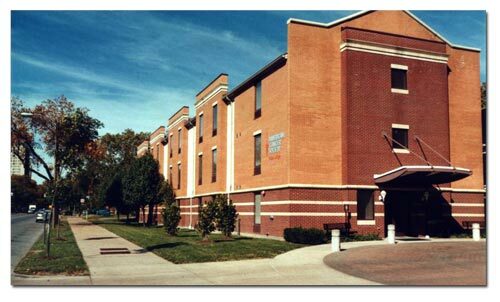 It seems that every few years there has been discussion of renovation of Carr School for senior apartments, as was recently done with nearby Franklin School, or most recently, as seen on Arcturis' website, renovation for use as a charter school. 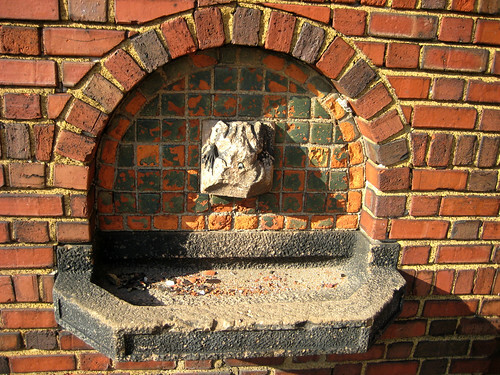 A small fountain at the northwest corner of the school yard. Preserving Carr School is important not only for its beautiful architecture, but also because it is one of the only buildings remaining from the original Carr Square neighborhood. With the exception of a factory building a block north and a small commercial building on the same block, there are no other original buildings within sight of the school. The once dense urban neighborhood has almost entirely succumbed to "urban renewal" in the form of housing projects, street reconfigurations and industrial parks. 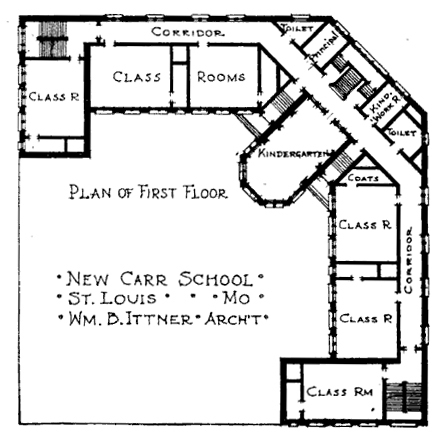 This 1909 Sanborn shows the "new" Carr School outline dashed in around a much small school that had been built in 1885. 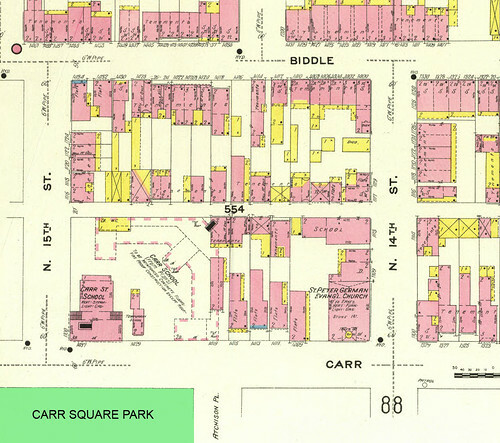 To take advantage of the tight urban site, the new school was pushed to the north and east edges of the parcel, leaving the school yard opening out toward Carr Square Park, which still remains and has been expanded east to 14th street. With the recent heated controversy about the proposed CVS pharmacy at Lindell Boulevard and Sarah Street a few people have made mention of the nearby Windsor Hotel. 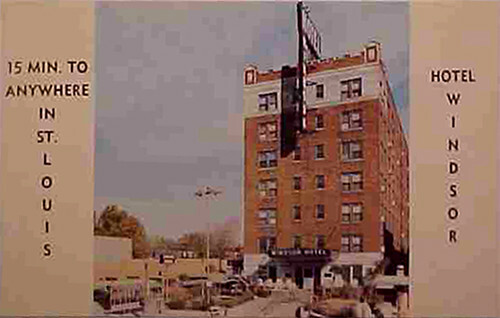 The Windsor Hotel was located at 4209 Lindell near the corner of Lindell and Whittier across the street and a block west of the proposed CVS site. 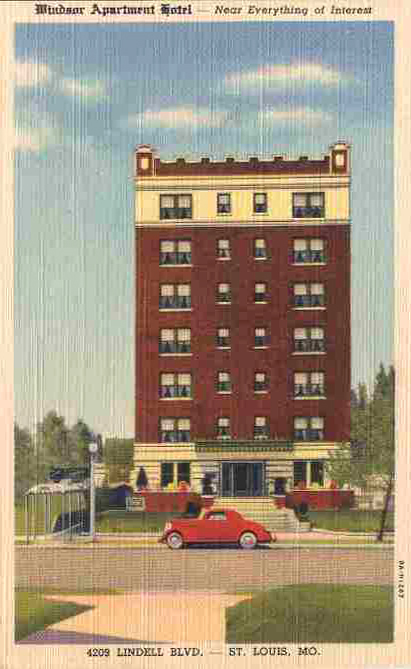 The SRO hotel was likely built in the 1920's as it is very similar in style to the surviving Leonardo Apartments across the street that was built in 1922. 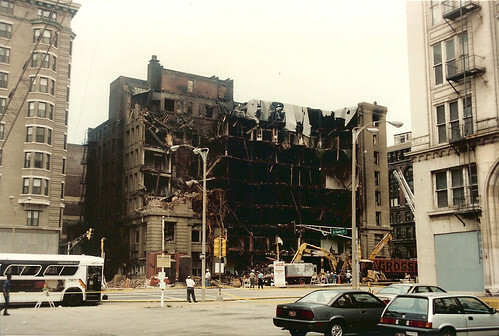 The Windsor was demolished in 1993 to make way for new offices in a four story building for the American Cancer Society as well as the Cancer Society's adjacent Hope Lodge. While neither building is outstanding architecturally, they adhere to the standard Lindell building line and seem to fit their context fairly well. The overall density of the site is at least equal if not greater than prior to construction of the new buildings. Almost directly across from the Windsor in almost the same footprint as the generic Walgreens which replaced it was the fabulously modern Martin Cinerama Theater. According to Cinema Treasures, the theater was built in 1962. It was one of four Cinerama Theaters built by Roy Martin of Seattle. The others were Seattle, Atlanta, and a near twin to ours in New Orleans. They were billed at the time as having the largest indoor screens in the world, measuring 100 feet wide on a curve. If red was your favorite color, the auditorium was the place for you. The giant semicircular red curtain surrounded plush red seats floating on a sea of red carpet. Depending on which account is correct, the large auditorium had either 913 or 1,120 seats, both huge numbers compared to today's standard movie boxes. Theater photos an online tribute to the Seattle Cinerama. 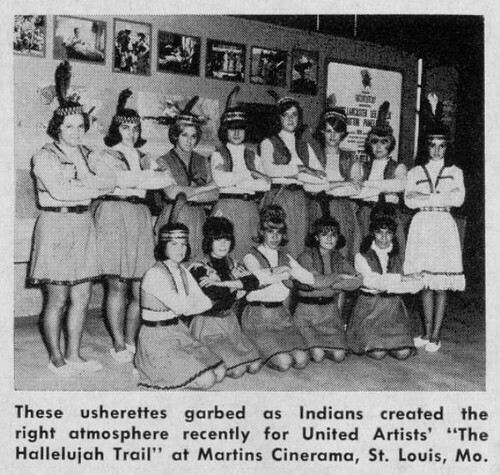 A news clipping from the days when theater operators went all out to set the mood for their feature show. There was after all only one show, not 14 or 20. 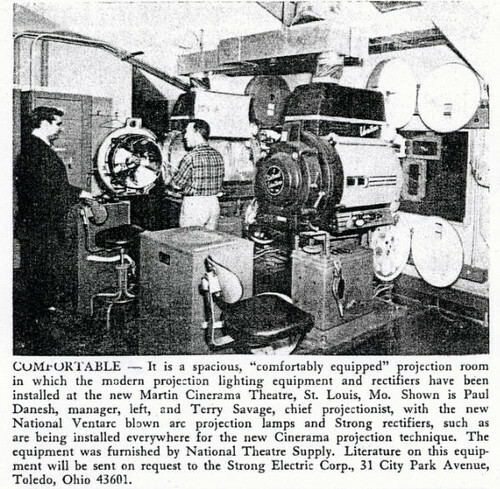 The Cinerama theaters used three synchronized 35 mm projectors to project on the giant curved screen. The process had been developed in the 1950's in an attempt for the movie industry to compete against television. Article clippings from another Cinerama site. The Martin Cinerama Theater was closed in 1988 after a run by Trans Lux Theaters. 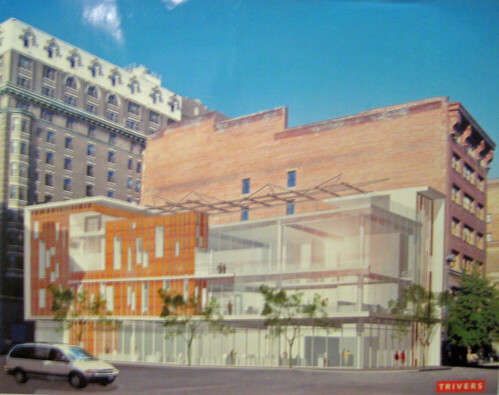 The theater and another building to the east were demolished in 1997 to make way for the caged-in Walgreens, which is set back about 20 feet from the established Lindell building line. It is the only building on the block face from Boyle to Sarah that does not conform to the standard.